What's happening right now? 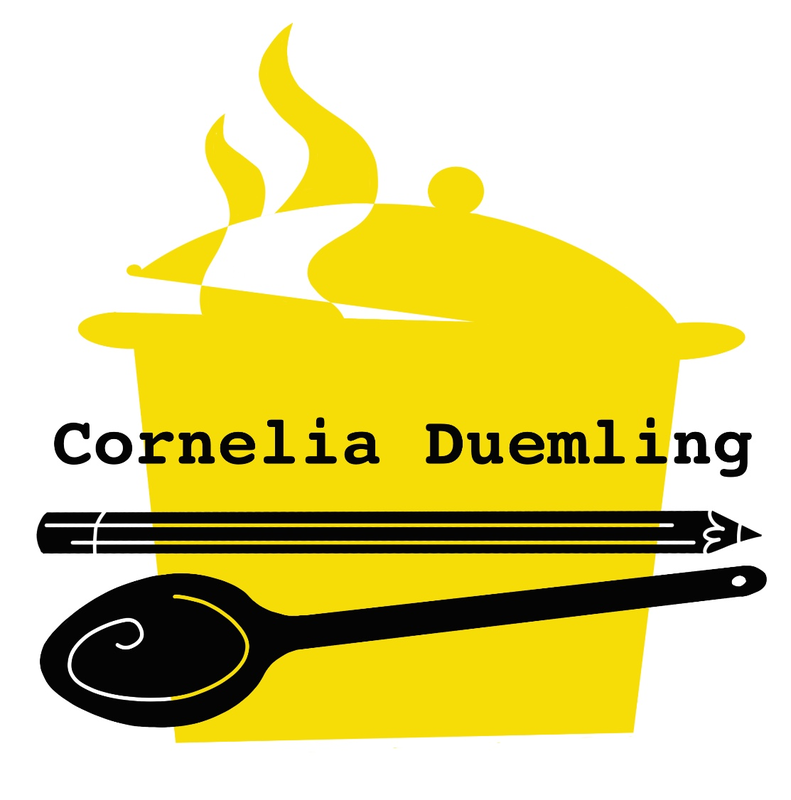 - corneliaduemlings Webseite! Cooking is not just food preparation. Though a recipe is akin to a road map, you do not have to stop there. It is like moving into a new neighborhood: You grow out of the map using stage very quickly. You discover new ways. Maybe you like their vista more, or they are quicker. No matter why, but you adjust them to your needs and liking. The same goes for recipes. Once you've tried it, and decided to make it more often, the process begins. Maybe you don't have one of the ingredients, but something that could replace the missing one. Or you like another one better. In short, you get to know your recipe and start to play around. This happened to this brownie recipe here. It got translated, adjusted, tweaked and teased until it ended up in its actual form. It was originally released in Gourmet magazine over ten years ago. We had moved back to Germany at this point in time. Back to metric measurements and balancing ingredients. I never warmed to measuring with cups anyway, because I normally measure ingredients mostly for baking. And there it can make a big difference if you use 50g more or less of something. So one day I took my notepad, the measuring cups and the electric balance, weighed all the ingredients, and jotted them down. Then I adjusted all weights to full ten grams. After a while some of the flour got exchanged for more cocoa to push the chocolate flavor. And one day we found out that one or two tablespoons of rum or cognac chisel out the chocolate even more. Now I've made it so often, that I know it by heart. Countless friends asked for it and spread it even more. So, yes, in a way it is the recipe from Gourmet magazine, but it also is a completely different recipe. It is part of the food history of our family. And this is how good recipes work: They develop a life of their own. The temperatures are on the rise and we are happy for refreshing food. Cucumbers are on top of that list. They are cool, contain a lot of water, and are extremely versatile. No matter what you are cooking, chances are high, that a cucumber salad can go with it. Though store bought cucumbers are not bitter anymore, home grown ones can be. Normally the bitterness sits close to the stem. To make sure you have removed all bitter parts, slice off a piece close to the top and lick. If it tastes bitter, repeat until there is no bitterness to the taste anymore. If there are hard kernels, or the watery flesh around them turned slightly sour, just cut the cucumber lengthwise and scratch out the kernels and the surrounding watery flesh with a tea spoon. Cucumbers have a wonderfully subtle taste. The thinner you slice them, the better their aroma can mix with the dressing. There are salads like greek salad where the cucumbers are cut in chunks to obtain a distinct burst of flavor with every bite, but that is not our aim for today. Today we go for a smoother flavor. No matter what kind of dressing you choose, first you wash your cucumbers. If they are not organic, or their skin is rather hard, peel them, remove the kernels if you prefer that, and then slice them. Really, really thin. Add salt, pepper, oil or whipping cream (actually coconut milk works fine, too), wine or cider vinegar, and what else condiment you choose. Keep it simple! You don't want to overpower the delicious cucumber aroma. But: Don't be shy either. Taste and adjust the seasoning until it fits your taste! Mix everything thoroughly. If you like, you can throw in some herbs: Dill pairs well with whipping cream, parsley goes with nearly everything, and cilantro is great for asia style. No matter what herb you pick, choose the leafy ones. Harder ones like thyme or rosemary can be overpowering. Well now it is time to slice and mix and taste for yourself! 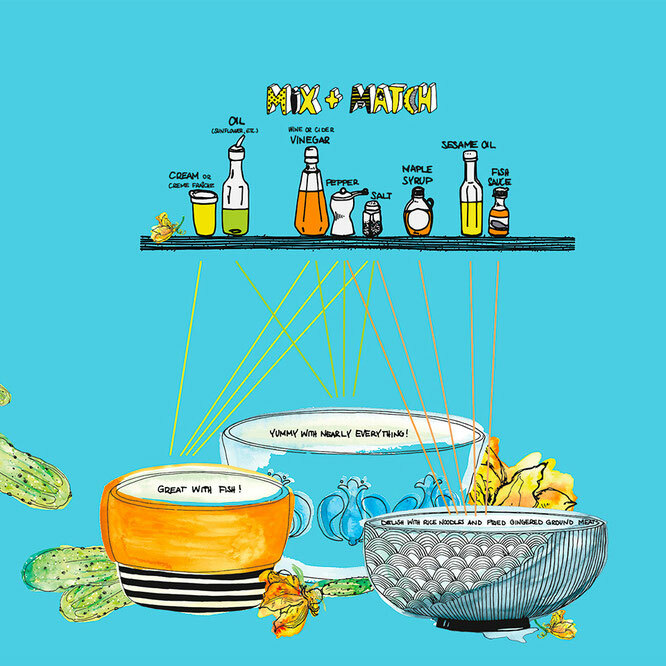 Below you'll find some ideas to mix and match or you can find the complete illustration in the gallery. It doesn't matter if you broke your rolling pin on a burglar, trying to enter your home, are on vacation without your trusty equipment, or just plain and simple never had one: You can roll out your short dough quite nicely without a rolling pin. All you need is a bottle with a straight body and no raised patterns. Best works this celebratory wine bottle, you opened after defending your home successfully. Why a straight body?, you might ask. Everything else would cause a dinted and uneven surface, which would cause uneven baking and so impair the entire dish. Cover the labels with a wet rag until you can remove them. Using warm water to wet your rag speeds the label soaking. Scrub away all residue of the glue. Make sure the bottle is absolutely clean, and no paper or glue remains. This would either make the pastry stick to your bottle, or impress little patterns in it. Well, hello. Nice to meet you. I would love to hang out a bit with you in my kitchen. Why should you read this? Honestly, I don’t know. Maybe because you like food and I do, too. I am becoming an illustrator and I love food. What is more obvious than combining the two? After 34 years of cooking at home, at work, and on travels I've learned a lot about food and I am happy to share it with you here on my blog. 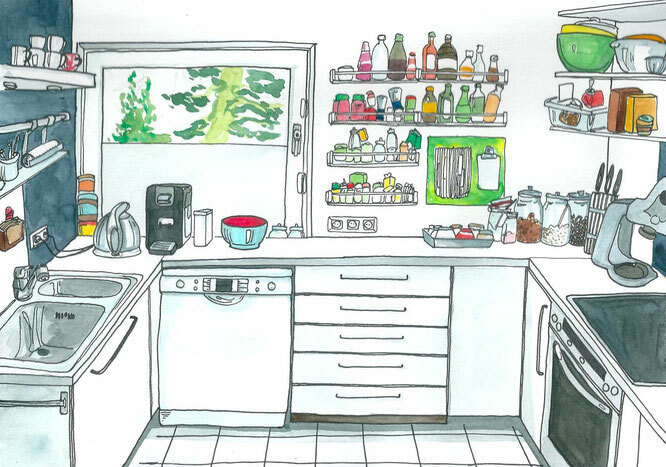 You can enjoy some kitchen stuff and I can train my illustration skills. This should make two happy campers! As this is by no means a one sided conversation, feel free to contact me. You want to know how to get the dough into the pan when you don't possess a rolling pin? Or some question like this? Well, just go to the contact page and let me know. As I am an autodidact there are naturally a lot of books or tutorials I am using. Those especially inspiring or helpful to me, are listed here. Maybe they are of use to you, too. Here you can find out a bit more about me. You find cooking intriguing, but there is nobody you can ask the plain and normal stuff? The things you'd never find in a cooking book, because the authors assume it is common knowledge? Well, then, welcome here! Let's hang out and have some fun. Here you find my illustrations. If you are interested in my work, please feel free to contact me.